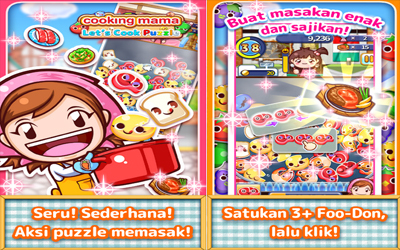 Cooking Mama Let’s Cook Puzzle APK latest version 1.0.5 has been released. Cooking Mama game is always awaited and certainly show something unique inside. Starting from flipping eggs, raised meats, and also knead the dough into something unique and rarely found in other games. However, recently the developer create a game with new genres such as Puzzle. The latest game that could be considered quite out of the track titled Cooking Mama Let’s Cook Puzzle. Surely you will find the latest and quite a different experience on the series before. This game can be fairly similar to Line Pop which brings together at least 3 food ingredients to make a tasty meal that will be served to visitors. You will meet characters which will give you instructions how to play this game. How to play the game is also fairly simple, you can match 3 foodstuffs by way of moving these foods. The more you can match it to the more score obtained and more happy customers. After completing the first store, you will go to the restaurant with bigger scale. Surely there is food that is also increasingly being given the wide variety of food present in the restaurant. But if you want different foodstuffs you have to have in advance that will come into your cooking pot. There is also the Heat feature that allows you to cook food faster and score obtained is also better. In addition when cooking you will be able to find special items such as salt, pepper or other spices that will make your score is doubled. Of course there are times when cooking that shows that the restaurant is closed if it runs out. In addition you can also increase the level of food ingredients that you have to add more score you get when cooking. Cooking Mama Let’s Cook Puzzle can be fairly addictive romp given better score can you do in this game. In addition, you can collect gold to purchase a variety of groceries and also a raffle ticket to win a food that is hard to come by. Fulfill quests by completing puzzles, and your shops will steadily grow! From time to time, Papa and special guests will show up to try your food! Make a lot of dishes, satisfying the customers who come to your shops! It’s way more different than the other Cooking Mama and this one just has more content, and things to do. Since it’s a puzzle game you just mix and match to create recipes for your customers. I really find it cool that you can create new recipes to satisfy your customers. Also the more customers you get, the more your shop looks more beautiful. I’ve got to say this game is really spectacular.